It’s back! Well, almost. After a slight delay following a crash-strewn World Supersport FP1 session, the World Superbike riders got going for the first official session of the 2013 season. Red Devil Roma Aprilia’s Michel Fabrizio was the surprise leader, half a second ahead of his nearest rival Leon Haslam on the PATA Ten Kate Honda. Leon Camier continued to show Suzuki’s improvements over the winter with a third place. After that big gap, the next 12 riders were covered by just over a second, hinting that there could be a lot of action this weekend. The only riders to fall in the session were Alstare Ducati’s pair of Ayrton Badovini and Carlos Checa. Badovini had a bad fall during testing last week therefore there was fear he may have injured himself further, however Alstare have confirmed both riders were OK.
All the Brits were in the top 10, apart from Laverty in 11th. 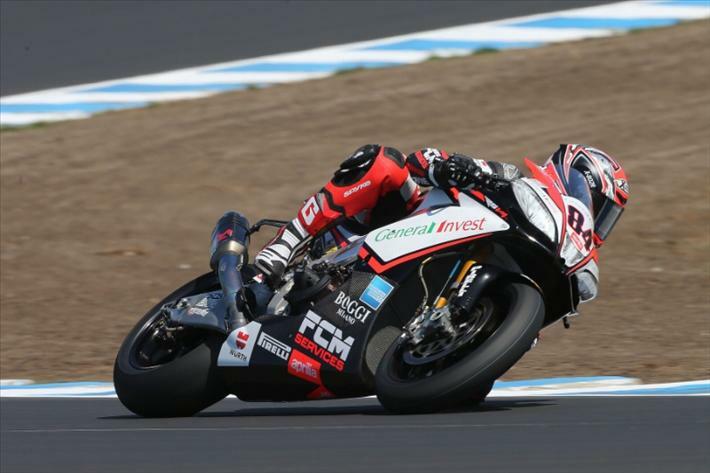 If you’re unsure who’s where this year in WSBK, check out our guide here!